Will you be completely and utterly sad if pandas go extinct. Would you have a panda for a pet? Do you have National Geographic Panda? ang napili ng mga taga-hanga: No, but I want to. How would you react if pandas went exstinced? what would you do? Beijing, June 18 (IANS) Giant pandas in China's research centres have become 'spoilt' because of the extra care taken sa pamamagitan ng experts for these lovable creatures that were once on the verge of extinction. Experts sinabi pandas should be ibingiay 'less care' than they are currently used to, as it may prevent them from adapting to life in the wild. 'It is unfair for the mga hayop to breed them in captivity like pets,' Zhang Jinyuan, deputy head of the Beijing Zoo, was quoted as saying sa pamamagitan ng the Shanghai Daily. Plush pandas and stuffed panda madala toys for panda lover of all ages. I know this has nothing to do with pandas but if you are a tagahanga of the 4kids or RAI version of Winx Club then please join! We could use your help! a question ay idinagdag: how come red pandas look different than regular pandas? 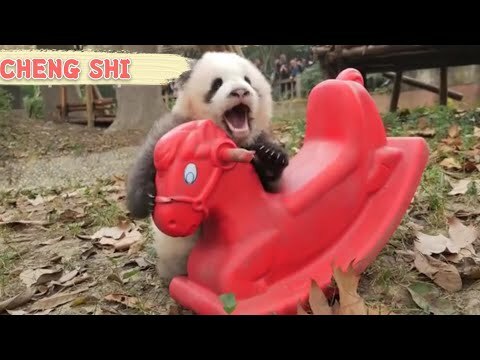 a video ay idinagdag: Adorable GREY Panda CHENG SHI on his Horsie!!! what are pandas main pinagmulan of food?